From time to time, we docs borrow each others' blog posts. Since Dr. Andy got to writing about this patient before I did, and he did such an excellent job writing about it... I am going to share it with you! Here is the link to his original post. No, that's not a date. Well, it is, but as a date that number is not the subject of this post. 1090 mililiters. That's over a quart, for those who need to know it in those terms. Not a lot of liquid, really, depending on the context. 1090 ml of gasoline would take most cars only a few miles. 1090 ml of warm water would be enough to wash your face. 1090 ml of bloody serum in a man's pericardium can be the difference between life and death. I don't often get into medical detail here, but you need to know that the pericardium is the membranous sac that surrounds each of our hearts. It is normally a pearly color, smooth, with just a bit of moisture inside to allow the heart to slide smoothly under it as it beats. But Joseph's pericardium has turned against him. Swollen, red from the tuberculosis that spread there from the surrounding lung. 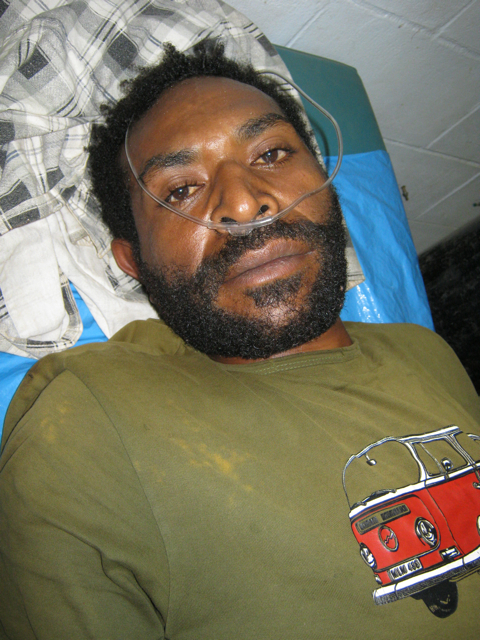 Over the last few weeks, he had become increasingly short of breath, and weaker. As the inflammation of the pericardium increased, serum began to ooze from it's inner surface, and blood began to leak from its now-engorged capillaries. As the fluid built up, it began putting pressure on the heart. More and more, the heart could not fill adequately between contractions, so the amount of blood it could pump diminished. Joseph's blood pressure decreased. Any movement became an exhausting exertion. 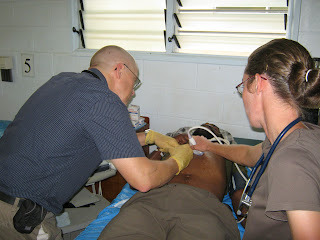 Joseph went to the nearby clinic in his village. A few days of amoxicillin did nothing to reverse the relentless progress of the TB. Finally, Joseph's relatives realized that he was dying. They found someone who would drive them to a nearby government hospital. There they were told that there were no doctors to see him. 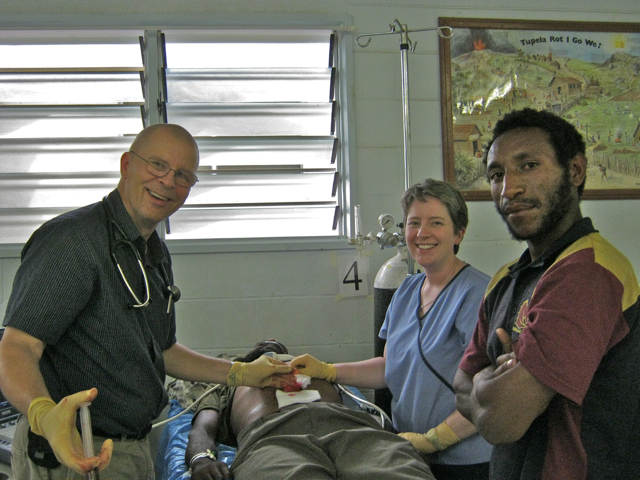 In PNG, it is the privilege of all senior doctors to take "Festive Season Holiday"; basically 2 months off. The junior doctors who are supposed to keep things going want to be like the senior doctors, so they take some time off, too. Joseph's family headed toward Kudjip. When they brought Joseph into the ER, I was working on another man. I saw that the nurses were checking him. One asked to use my pulse oximeter. This showed that Joseph's blood was carrying adequate oxygen. I did not fully appreciate just how sick he was. I listened to his lungs and heard good air movement, so I left him for the nurses to "screen". He was making a lot of noise, and I thought maybe he was just being dramatic. A little while later, the nurse told me that Joseph was ready to be seen. I examined him more carefully this time, but didn't find anything specific, except that his heart beat was rapid and soft. I ordered a chest x-ray. For those of you who don't know what you're looking at, suffice it to say that it's not OK. I went and got the ultrasound machine. 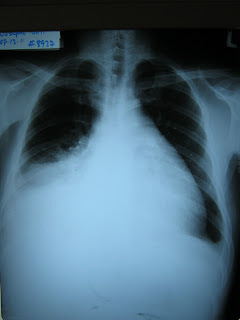 It showed me that most of the volume of what appears to be the heart on the chest x-ray was fluid. The heart was barely contracting under the pressure that surrounded it. There was also a fair amount of fluid in the right pleural space, the space between the lung and the chest wall. There are many things that can cause this, but here, most of the time, it's TB. By this time all of the patients in the Outpatient Department had been seen, and doctors were starting to home. I felt that we needed to drain some of that fluid out of the pericardium, but I'd never done it before. I knew that Dr. Erin Meier had done several, but she had left. I found Dr. Steph Doenges, who is on call this evening. 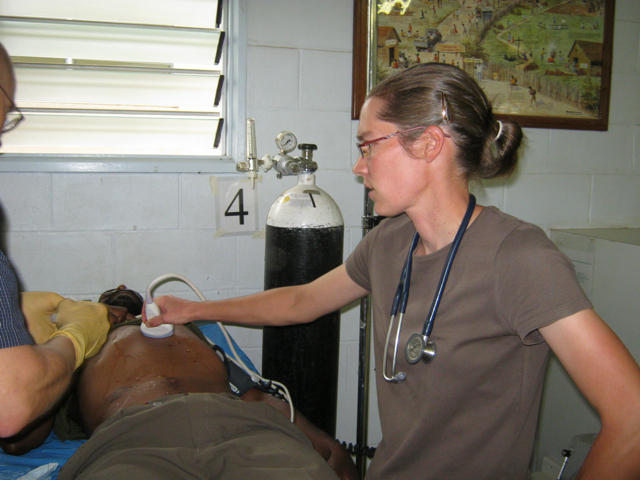 She had helped on a pericardiocentesis once. She agreed with my idea of involving Erin. After sever failed attempts, I reached Erin, who came right in. The three of us began to assemble supplies. It was decided that since I had never done or even helped with one before, that I should be the one to do this. This may seem like backward logic to some of you, but it makes complete sense to us. Erin held the probe for the ultrasound that would guide my needle into the pericardial space. I use an intracath, usually used as in intraveneous catheter. This is a plastic tube around a steele needle. We found a nice long one. I washed his chest with an iodine solution. Ering guided the ultrasound as I guided the needle into his chest. The needle appeared in the image. I slipped the steel needle out of the plastic sheath, and connected a syringe. As I pulled the plunger, dark, bloody fluid filled the syringe. 20 ml. They say that many times you only need to remove a few ml from the pericardium in order to make the patient much better. The patient didn't look any better. I tried connecting some IV tubing so we could just let it run, but the blood was too thick, so I went back to the syringe. Syringeful after syringeful came out, and was emptied into a nearby basin. When the fluid wouldn't come any more, we'd reposition the catheter. We worried that a random movement by me or by the patient would dislodge it, so Steph put on sterile gloves to hold it. The patient's relative counted syringefuls, and totaled the volume. "Wow, we're past 100 ml!" one of us commented. A few minutes later, "hey, that's almost 500!." Then Joseph began to quiet. With her free hand, Steph felt his pulse. "Stronger", she said. We could see the movement of the heart on the ultrasound screen returning to normal. Joseph began to talk to us. Erin and Steph asked him about his wife and children. A boy and a girl, ages 5 and 3. The brother and I were counting and adding. The tally was nearing 1000 ml. A liter! Now we began to have to manipulate the catheter more often, but still the flow came. At some point someone (yes, it was me--the mood was much lighter as we watched Joseph improve from moment to moment) began to speculate as to whether the Guiness Book of World Records had a category for the largest volume of fluid removed in a pericardiocentesis. Probably not. We help people all day long. And once in a while, with God's help, we do we have the opportunity, despite our limited equipment, supplies, and experience, to save a life. Sometimes in a critical situation there isn't anything we can do, and that is miserable. But often it goes well, and a life is saved. That's really a lot of fun! We all stopped by medical ward the following day to check on our patient and get a picture with him. He was a hundred million times better than when he came in the day before. Doesn't he look great?